Protecting oneself in battles, whether small or large, is an absolute must. From the knight called upon to defend a kingdom to those jousting in times of peace, wearing the right medieval armor for protection was essential. Pearson’s Renaissance Shop carries an extensive line of body protection, from chain mail armor and leather protection to full suits of armor. 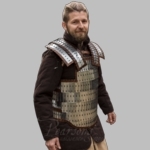 Whether you are headed to the renaissance fair or to a reenactment, Pearson’s has all of the period-accurate medieval clothing you could ever need. 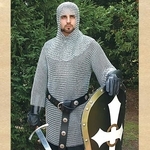 Browse through our breast plates and cuirasses, select the perfect vambraces, gauntlets, and gloves, and peruse our extensive collection of leather body armor. Our costumes and accessories are expertly crafted to be authentic and durable – ready to stand up to any battle, and close scrutiny from fellow fairgoers.